It burned out while I was taking the picture, go figure. 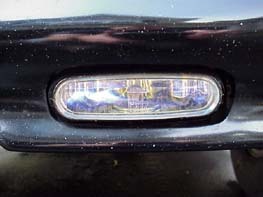 I did a lot of shopping for fog lights before deciding on Catz MSX fog lights. They simply appear to be a higher quality light than the PIAAs and many others. I installed them by cutting away part of the original plastic fascia on each side of the license plate. I have since installed a Performance Products spoiler and had cut openings in the fiberglass to install the lights. I wired them so that they will activate when I turn on the parking lights. 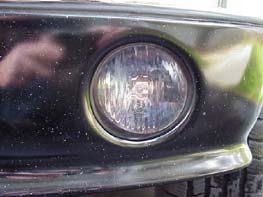 The fog lights are controlled by a Toyota OEM switch installed in one of the cut outs in the dash. The Catz lights put out a very bright, wide beam that really lights up the road during bad weather. I am very happy with my decision on the Catz MSX fog lights. 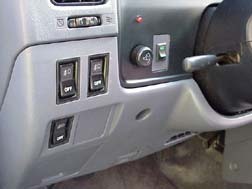 The left switch operates the driving lights. The right operates the fogs. The lower one disables the daylight running lights if needed. The switch on the right currently with the gray background is the master switch for my ECM package. 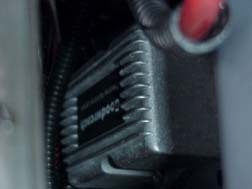 I ordered OEM rocker switches to control my lights from Performance Products. 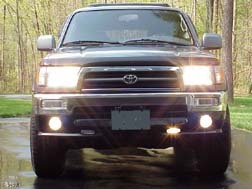 I was disappointed that my 1996 4Runner did not come with daytime running lights. I travel on a rural highway everyday and have had several near misses with people pulling out in front of me. I decided to install daytime running lights for added safety. Positive side of the battery. It is mounted behind the battery on the inner fender wall. 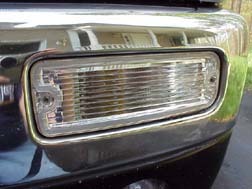 The unit will provide about 7 volts to the low beams. This reduced voltage reduces the load on the electrical system and extends the life of the low beams. I also decided to install a separate switch so I can deactivate the system if I choose. The unit will activate the low beams at the reduced voltage about 10 seconds after starting the vehicle. The unit will shut off the headlights if the parking brake is set or the parking lights are turned on. The latter is for those of us that have to go through guarded gates like at military bases and you are required to shut off the headlights to be identified. All you have to turn on your parking lights or at night turn off your headlights and leave the parking lights on. While connecting to the low beams I did discovered that the headlights on the 4Runner are set up much different than most domestic vehicles. It appears that when you turn on the headlights a relay is tripped and it supplies 12 volts to both the low and high beams. The switch is on the negative side of the circuit. The installation manual included instructions on how to install the unit on the Japanese made GM cars. Apparently they all use this goofy set up. You have to remove the high/low beam switch and cut a wire on it. Then install a diode to prevent the unit from powering the high beam lights if the high/low beam switch is set to high beam. I did not complete this step. When the unit is active and my low/high beam switch is set to high beam the unit will power the high beams. So I have to be careful to leave the switch in the low beam position. Since installing the unit the incidents of people pulling out in front of me has been greatly reduced. Also as a side benefit, those left lane bandits tend to move out of the left lane a little sooner when I come up behind them, but not all of them. I am convinced that day time running lights is a safety feature that everyone should have installed on their vehicles. If it prevents one accident it is more than worth it. Many countries now require daytime running lights and since they have been required they have realized a 30% reduction in accidents. This is about the same reduction in accidents involving motorcycles in this county when headlights where required to be on all of the time. Have you ever wanted more light when zipping down a country road at night? I decided that more light would be nice. I ordered the front spoiler with the Hella H3 driving lights from Performance Products. I dry fitted the spoiler and lights to make sure everything fitted correctly. I then removed the spoiler and had it painted satin black. This is the same color as the "B" pillar between the front and back windows. Note the chipped paint from road debris. Installing the spoiler is not very difficult. All you have to do is line it up and drill some mounting holes and bolt it to the bumper. I removed the bumper and attached the spoiler to it and them reinstalled it as one unit. The hardest part is getting the lights aimed properly. They are installed to the spoiler using special brackets and "J" nuts. The "J" nuts allow the lights to be moved into position and when you get them aimed properly, just tighten everything down. Remember that these lights can only be operated when it is legal to operate your high beam lights. The lights should be wired so that they can only be activated when your high beams are on. The very best place to tap the source wire into is into the wire bundle that comes out of the right side of the steering column. To access this bundle of wires remove the lower dashboard panel beneath the steering column. Use a circuit tester and poke through the insulation of the wires until you find the wire that is hot when the high/low beam switch is in the high beam position and when the switch is flashed. I have found that the color code of the wire is not the same for every model year so you will have to hunt for it. Do not touch the wires that are covered with yellow heat shrink or yellow loom wrap. Those are the air bag wires. When you find the proper wire splice into it and run it to your dash switch. Run the wire from the switch to your relay. This way you can leave the switch in the one position and the driving lights will activate whenever you activate your high beams. If you decide to deactivate your driving lights, just turn the switch off. I installed the PIAA H3 Super White bulbs in the driving lights. Now when I drive down a dark country road I can throw more than enough light down to road to blind those suicidal deer. They also come in handy to give those left lane bandits a reminder to get out of the left lane when faster vehicles approach from the rear. I get all kinds of compliments on how well I can light up the road and how nice the spoiler and lights look on the vehicle. I have noticed that road debris is chipping the paint on the spoiler. I am considering repainting the spoiler using a chip resistant paint in body color. Ron did this on the spoiler he installed on his 4Runner. His really looks nice. I installed the PIAA Super White H4 head light bulbs. I put one in and left a stock in the other side to make a comparison. The PIAAs are much brighter and give off a very white light. They make the stock lights look a dingy yellow. The PIAA Super White lights are much more expensive than the stock lights, but once I drove at night with them I will never use the stock lights again. The best price I have found is from DSI Mobile Electronics in Laurel Maryland. I get them for $60 a pair. I do recommend that if you decide to get them, buy two packs that way you will have a spare on hand. These lights are very popular and may be hard to find when one of yours burns out. I normally do not like those so called clear replacement lenses folks are going nuts over. Most of them are not clear, but just colorless. Ron got some OEM turn signals that he installed in his bumper. They are imported by JAOS/Winnax. These are different than what you normally see. The look very nice and appear to be a very high quality. I thought about it for a long time and decided to get them. Performance Products had them in their catalogue for about $60. I gave them a call. The order taker promised me that they were the same ones that JAOS imported so I placed my order. The package arrived and they were not the same. They look just like the stock lenses, but without color. I called them up to arrange to send them back. Initially they refused to let me send them back. I explained that they are not the same as the picture they have in their catalogue and told them to check their records to see how much stuff I have ordered from them. I told them that if they did not take them back I would never order anything from them again. Of course there is nothing left for me to buy. They agreed it was their error and told me to send them back. I then ordered the right ones from JAOS. I had to special order them. They no longer stock the OEM ones and are now stocking the same crappy ones that Performance Products is selling. I really like the quality of these OEM lights.